Looks like a rock concert, right? Not exactly. 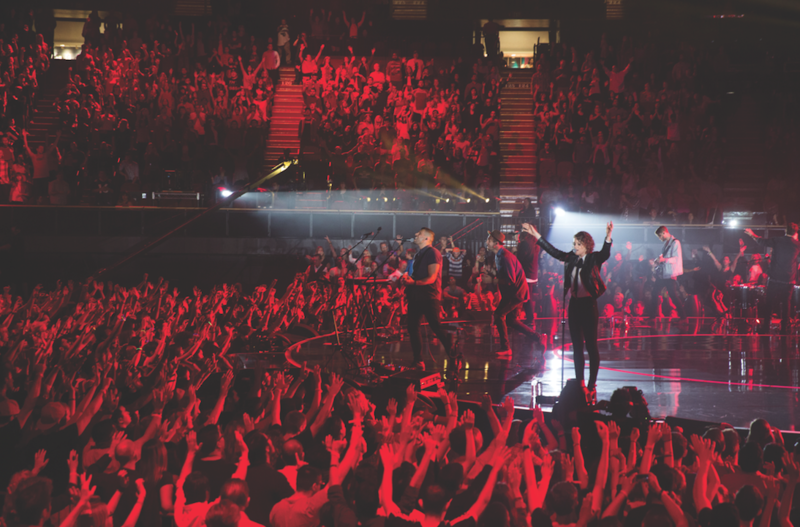 Megachurch services replicate the exciting concert atmosphere in order to attract members. 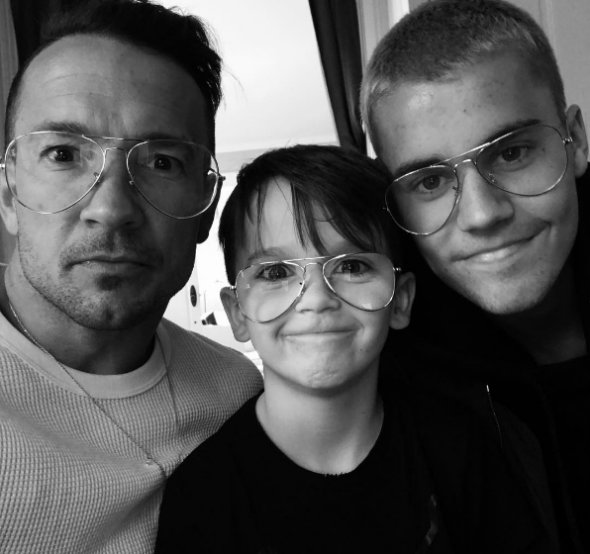 Bieber poses with Hillsong pastor Carl Lentz and his son. Pop icon Justin Bieber disappointed many fans when he canceled the remainder of his world tour recently. His reasons for doing so remain unclear, but rumors are swirling that Bieber has had a “spiritual awakening” of sorts and that he’s “rededicated his life to Christ”. On the surface, it seems an unconventional move for a 23-year-old ultra-celebrity. What gives? Well, Bieber has become a regular member of Hillsong, a Pentecostal megachurch with branches all over the world. He also happens to be close friends with one of the church’s most influential pastors, a man named Carl Lentz. Lentz had been known to offer counsel to the young star, and is believed to be one of his most trusted advisors. Reached for comment, Lentz explained that he helped the pop star to reflect on his “own view on the path in life he should be taking.” Apparently, that path wasn’t to keep touring. However, there has also been speculation that Lentz has ulterior motives in bringing Bieber closer to the church. Sources within Hillsong say he wants Bieber to become the new “face of the church” – in the same way that Tom Cruise has been the face for Scientology. 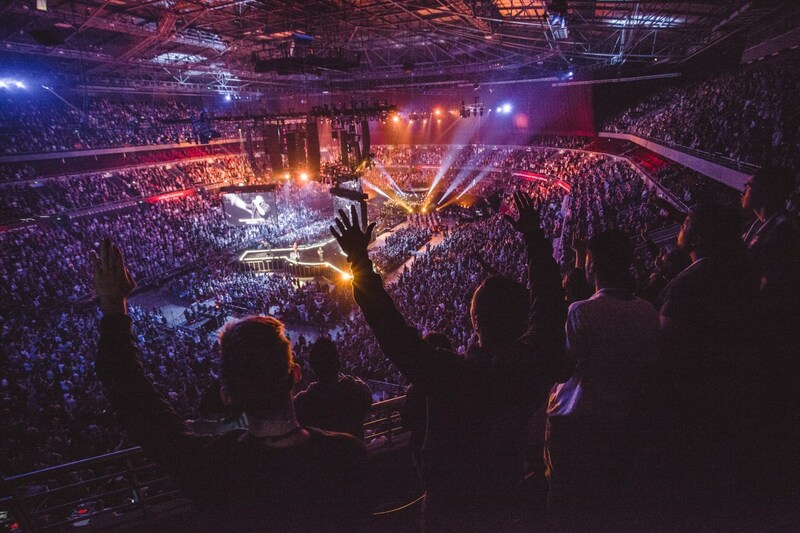 Hillsong is just one of many megachurches to see a rapid rise in popularity, particularly among young people. These massive congregations more closely resemble concertgoers than churchgoers – and the buildings themselves are more like stadiums than houses of worship. So what makes them so popular? Megachurches provide a new approach, a modern and exciting way to practice religion. The pastors are energetic, stylish, and relatable. They often present themselves as the cool older kid you always wish you were friends with in school. Megachurches ignore stuffy traditions that make services boring, instead vying for high-energy sermons and musical numbers blasted out of big expensive speakers. Some even install restaurants, gyms, and theaters inside the church – anything to get people in the door and keep their attention. A commonly heard mantra is “we are not a normal church.” Indeed, far from it. One thing is clear: this formula is working. Megachurch phenomenon shows no sign of slowing down; membership has more than quadrupled over the last two decades, and continues to rise. The Los Angeles branch of the Hillsong Church provides a prime example of how people are drawn in. The church opened just three years ago, yet already boasts a weekly turnout of over 5,000 members. The vast majority of new members are young people – millennials, or younger – who’ve found a reason to get excited about church again. Beyond the energetic “rock concert” atmosphere, membership certainly benefits from church services being star-studded affairs. Justin Beiber is a frequent guest at Hillsong, along with actress Vanessa Hudgens. NBA stars have also been known to make appearances on occasion, as have certain well-known LA fashion editors. None of this is good news for traditional churches, who seem to be fighting a losing battle on two fronts. In addition to Americans becoming less religious as a whole (making it hard to attract new members), their existing congregations are also being eroded as people flock to massive, glitzy megachurches instead. By spending a ton of money to “make church fun again”, these modern houses of worship are squeezing out their smaller counterparts. Have you ever attended a megachurch before? Do traditional churches have a future in a world dominated by big congregations? Traditionally, organizations were run on hierarchies of authority. In order to work within a hierarchy, you were expected to surrender your willingness to think for yourself and, instead, obey orders without question. Human creativity was suppressed while such a structure encouraged people to be closed-minded when exposed to any new information or ideas. People with open minds, on the other hand, can think for themselves and therefore become their own authorities. Being open to new ideas, they can awaken to creative, new solutions to challenges in their work and in their lives. I think people are defining spirituality on their terms. I grew up Greek Orthodox and attending a service back then ( or even now) is like being transported back to the middle ages. I can see where people particularly young people want to move religion in a different direction. The interesting question is do we still call all these religious gatherings a church? I attended some years ago a service at the All Souls Unitarian Church in Manhattan. During the entire sermon there was no mention of God, Angels, the Devil, Jesus, etc.. The message was a good one, help your fellow man. The sermon offered several suggestions on how each individual might wish to become more involved helping in their community. I certainly enjoyed the sermon along with performance of the Jazz quartet, but I wonder with no mention of any deity, how does this institution call itself a church? Should it still qualify for tax exempt status? Any thoughts? MUSIC has changed so much since I was a boy… give me Al Jolson over Justin Beber any day. 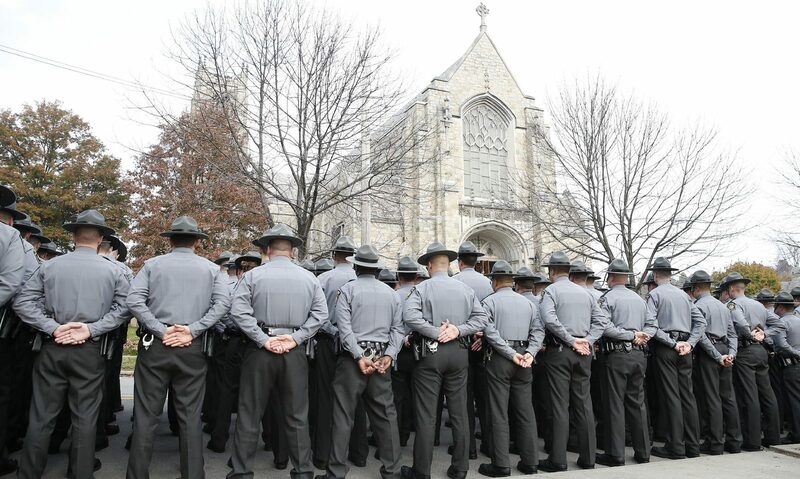 This reminds me of the mass rallies the Nazis held back in the 1930’s to attract members. Songs, energetic speakers, music, flags, torch he’s (they didn’t have arc lights back the. And spotlights that change colour with the beat of the music!) but it creeps me out. These mega churches really do creep me out. They are very cultish. Ok, the message is a good one, and it’s good to see so many youngsters getting interested in religion again, but what creeps me out is how soon before the message starts to become one of the cult of personality? Until a David Koresh type individual takes over? That’s what creeps me out! it is the same thing, the evil ones create an illusion to bring in the sheep, the rest of us need to keep talking so the young ones aren’t lead too far astray. Each person should find there own spiritual path. One size does not fit all. Amen! I don’t attend a Mega church, but I watch several of the Pastors on TV and enjoy their sermons. Go wherever God feeds your soul! Thank you Jesus churches are growing! Lord knows we need it! It is impossible for Gods elect to be deceived. My name was written in the lambs book of life before the foundation of the world was laid. I was confirmed to the image of Jesus Christ because I believe. It is impossible for Gods elect to be deceived.”. I hope that I am one of God’s elect. I’ve been saved and baptised. I joyfully and courageously follow God. And God and I have brought about big changes in my life. Yet, I most certainly have been deceived. In addition, I believe that if you look in your Bible, you will find many examples of God’s people being deceived. You can start with Eve. If God’s true message is being spoken, I feel comfortable with the venue. I dont see how mega church can justify owning a leer jet when Jesus rode on a donkey! I’m extremely uncomfortable in crowds. When a stadium of people are in agreement, how right can they be? God created a crowd to be maneuvered by Him, the israelites. Only that they were expected to understand every next move of God in their taking ahead walk . Nothing wrong with the crowd. After all people come closer to God only when brought about into that touching atmosphere. Lets cherish the moments, if people gather to praise Him. Thats eventually is requirement, that evey knee shoudl come and bow here and no where else. It stinks! Reminds me of the cult “One Way” in the 60s and 70s. I wouldn’t be too excited until we know more about this church. If this church teaches the word of God and Biblical truths, and not just sugar coated messages to make the people feel good about themselves then it could be a positive thing. Unfortunately too many churches want to be politically correct, and not Biblicaly correct. Teachings from the Bible will give the people what they need to hear, not always what they want to hear. LOL, I always referred to these churches as “feel good” churches. My mother goes to one and she pays through tithes and volunteering for no other reason then to make her feel good. I won’t judge people who attend, however, because everuone connects to their God in different way’s, but the pastor’s who run these churches are not men of God, they are men of money. It’s a buissness for them, nothing more, nothing less. I believe there is more evil in the leadership of these churches then in Vegas! If I want a show, I will go to a megachurch, if I want God, I will head to the lake! It is a sign of the time only. 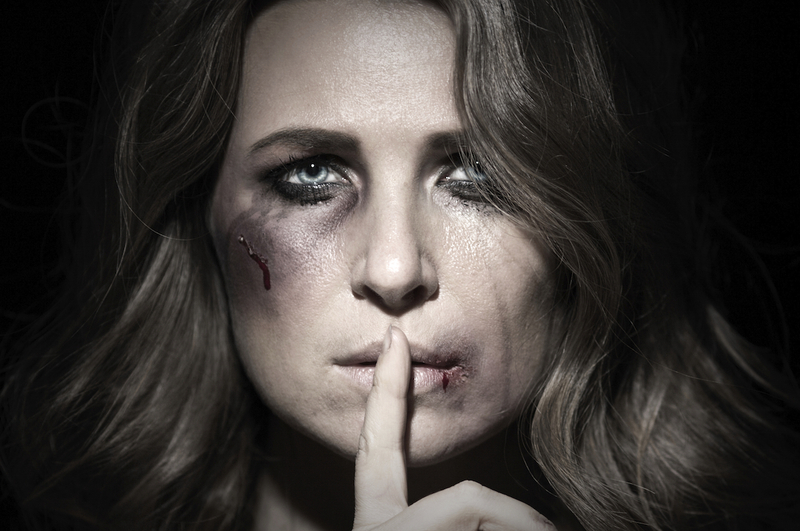 Religion lacks in spiritual depth and strength and genders separation instead of compassion and love. Feeding ego is easy and a great way to fill a huge building with young vulnerable minds seeking meaning and purpose. Large crowds in and of themselves are not a concern , but spiritual food and how to find grow and spread should be.